The goal of this report is to provide practical approaches, practices or strategies that agency program managers can apply. In our 2011 report on analytics use in the federal government, "From Data to Decisions: The Power of Analytics," we wrote about the tremendous budget pressures federal agencies face at a time when there is great public demand for government to be more effective and efficient. This report’s release sparked an overwhelmingly positive response from agency leaders and federal performance management practitioners who asked, “Where do we go from here? How do we get an analytics program started?” Their reactions demonstrated a hunger for understanding how to develop and grow an analytics culture within their agencies and incorporate it into how they perform their mission. That led the Partnership and IBM to join forces on another study to look at day-to-day practices that can help build and sustain an analytics culture, drive meaningful changes and achieve mission results. The goal of this report is to provide practical approaches, practices or strategies that agency program managers can apply. By sharing compelling stories of how agencies are developing, growing and sustaining their analytics and performance-management approaches, we hope to shed light on key steps and processes that are transferable to other agencies. We set out to learn what is working for managers and staff and what is not, specifically, how they are using analytics; how they got started; what conditions helped to grow their approaches; what challenges arose and why; and what success looks like. We found many parallels in approach across agencies and programs. Driven by budget realities and the push for more data-driven actions, agency managers were examining their programs in a disciplined, comprehensive way to determine how they conduct their business. We held four focus groups representing a cross-section of agencies and a mix of roles—managers, program staff and analytics staff. We also reviewed analytics efforts at the program level in seven agencies that vary in their missions, size and reach: Federal Emergency Management Agency (FEMA) Recovery Directorate, FEMA Logistics Management Directorate and Transportation Security Administration (TSA), all within Department of Homeland Security; Bureau of Indian Affairs (BIA) at Department of Interior; Air Force at Department of Defense (DOD); Internal Revenue Service (IRS) at Department of Treasury; and Food and Drug Administration (FDA), Center for Drug Evaluation and Research (CDER), Center for Devices and Radiological Health (CDRH), National Institutes of Health (NIH), National Institute of Biomedical Imaging and Bioengineering (NIBIB) and National Institute of Allergy and Infectious Diseases (NIAID), all at Department of Health and Human Services. We targeted a range of agencies whose diverse missions would enhance the transferability of our findings. A full description of the agencies we studied and more details on why they were selected can be found in the report. The agency officials we interviewed for both analytics studies were overwhelmingly positive about the benefits their organizations gained from the use of analytics. 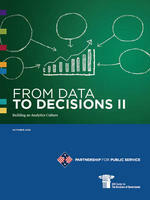 We hope that the experiences and lessons learned and shared in this report will help others now building or enhancing their agency’s analytics culture to reap similar benefits for their own agencies. Watch the video clip from ABC News! Read Tom Fox's blog, of the Washington Post. Read Federal News Radio's article. Watch the first and second video segments of the report's release.